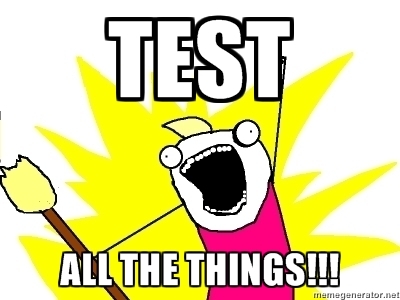 I think that was actually the name of a test I saw once: Test_All_The_Things(). I don’t recall whether it included an excited cartoon guy. 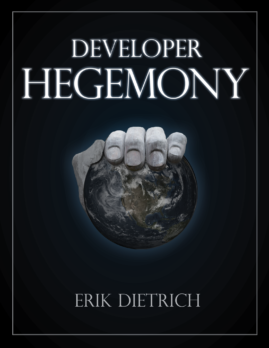 Point is, that’s sort of the natural desire of the unit testing initiate — big, monolithic tests that are really designed to be end-to-end integration kinds of things where they want to tell in one giant method whether or not everything’s okay. From there, a natural progression occurs toward readability and even requirements documentation. Now, if we decide to add a constructor parameter to our class as we’re doing TDD, it’s a simple change in on place. However, you’ll notice that I got rid of the nested test classes. The reason for that is there’s now a scoping issue — if I want all tests of this class to have access, I have to put it in the outer class, elevate its visibility, and access it by calling MyTestClass.BuildCut(). And for a while, I did that. //Setup is no longer necessary! Instantiating the CUT, even when abstracted into a method, is really just noise. After doing this for a few days, I never looked back. You really could condense the first test down to a single line, provided everyone agrees on the convention that Target will return a minimally initialized instance of the CUT at the start of each test method. If you need access to constructor-injected dependencies, you can expose those as properties as well and manipulate them as needed. 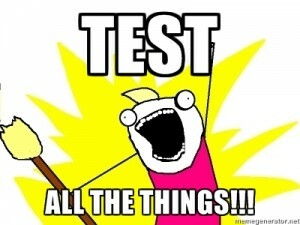 So at the moment, that is my unit test writing approach in .NET. I have not yet incorporated that refinement into my Java work, so I may post later if that turns out to have substantial differences for any reason. This is by no means a one size fits all approach. I realize that there are as many different schemes for writing tests as test writers, but if you like some or all of the organization here, by all means, use the parts that you like in good health. I like your SPV arrangement! I use an abstract base “template” class that I call AAA. It has an “TestInitalize” method that calls two abstract methods (Arrange, Assert) that you implement in each implementing class. Then, the “Assert” part is just a regular [Test]. This drives the arrangement of your tests around the “context” established in your Arrange method and by the time you get to the actual test, you have already performed the test in the Act. I tend to have multiple tests in each class and LOTS of classes (not sure if that is good). That’s a fascinating concept. I think there’s something fundamentally appealing about centering your testing around the same setup context as opposed to simply the same public member. I think I’ll have to try that out to see how it feels. Thanks for the the comment and the idea! That article by Phil Haack rings a bell — I’ve definitely read it. That could very well be where I got it.